visit website Bangkok has over the last 30 years become a city were skyscrapers dominates the view, and little by little the “old world” Bangkok disappears. But despite the ongoing modernization, there are still some small charming lungs to be found in central parts of Bangkok where you still can get a perspective on how the city once was some 30-40 years back in time. 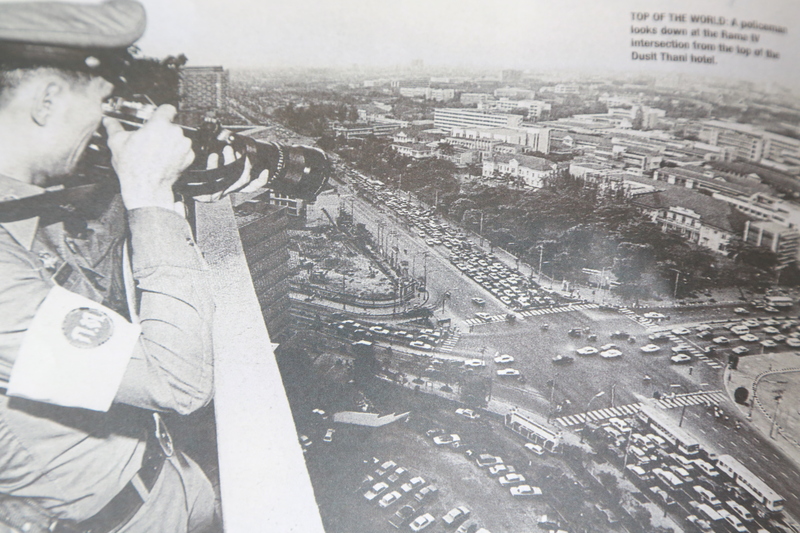 Picture taken from the roof of the hotel Dusit Thani in the Silom area in 1985. Photo of an article in Bangkok Post. One of the few constants in our life is change. It’s part of human evolution, and the same goes for cities. But normally, the changes are greater than we recall, and sometimes also appreciate. Memory is, and will always be, a floating factor. Sometimes we see a movie or a photo and we realize how massive the changes from the past are. A black and white photo in Bangkok Post from the Silom area thirty years ago, now part of Bangkok’s business area with all it’s skyscrapers and high rise building, made me hunt down one of those areas able to give a glimpse on how it once was. A small local community in Petchaburi, close to BTS Ratchatewi. When entering this “old world”, the lack of noise and traffic is remarkable. The busy day to day life in the more urban parts of the city makes you forget what peaceful means. There is no rush, no stress, but relaxed. Friends are talking and laughing, a small kid seeing this rather tall and blond stranger with a camera, starts doing his bicycling tricks to get the attention. I take a photo and show it to him. A proud smile fills the face. I smile. But for a different reason. Narrow streets, mostly without cars, low rise buildings and fewer people does something with you. I moved on, stopped and looked back. Could I live here? Yes, I could. The peacefulness, the serenity, in Bangkok of all places. But I also know, it won’t stay like this forever. In not to many years this small oasis filled with local charm will also be a construction site. The money seems to always win, at least here in Bangkok. There is no exception. 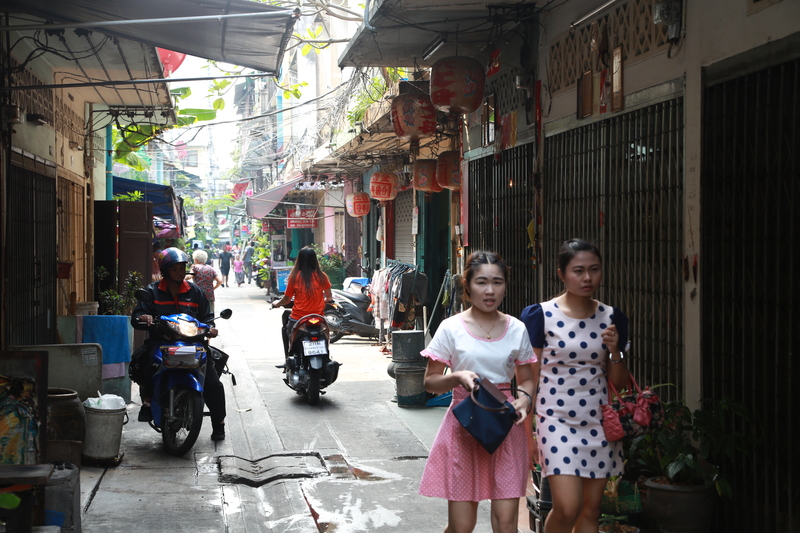 But the narrow streets, the low rice buildings, the way of living – heritages from their parents – is still present. What changes is stuff like clothes and equipment. The bikes are modern, the clothes are like those on the other side of the small portal to Soi 12/1 (Soi 12/2 on google map), the entry point to this hidden oasis. 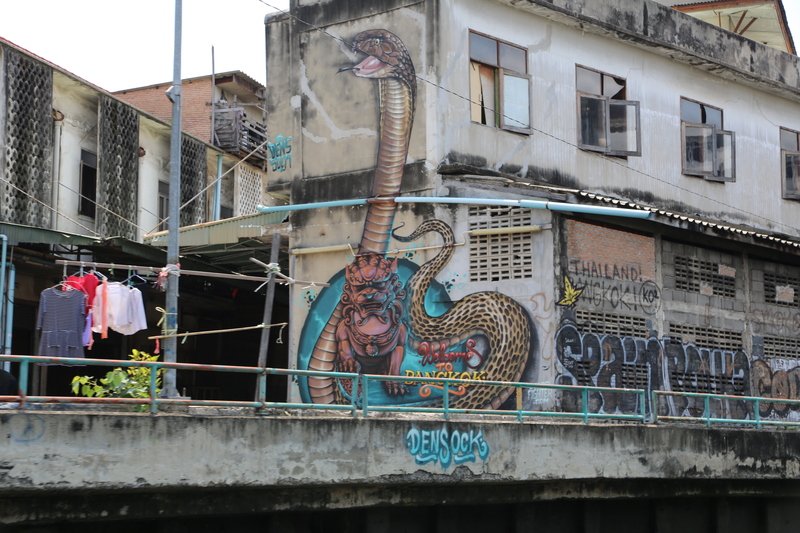 It’s not a museum, but it’s the old Bangkok. And it’s different from the modern and urban version. Another thing thats strikes me is the cleanness in comparison to most places in Bangkok. The garbage you normally see everywhere just isn’t there. The walls and the small patios towards the streets are decorated with green plants, and plenty of it too. People care. A small community where people still know each other, enjoying a cup of tea with their next door neighbor on one of the patios, discussing the local life or the businesses in the area. I step above the entrance to the Phetchaburi food market, in between narrow alleys and old houses. The butcher selling his meat, fresh fruits and vegetables on display wherever I turn my head. I feel energized just by being here. A rest for the mind, and a nice break from the hustle and bustle that surrounds most parts of central Bangkok 24/7. 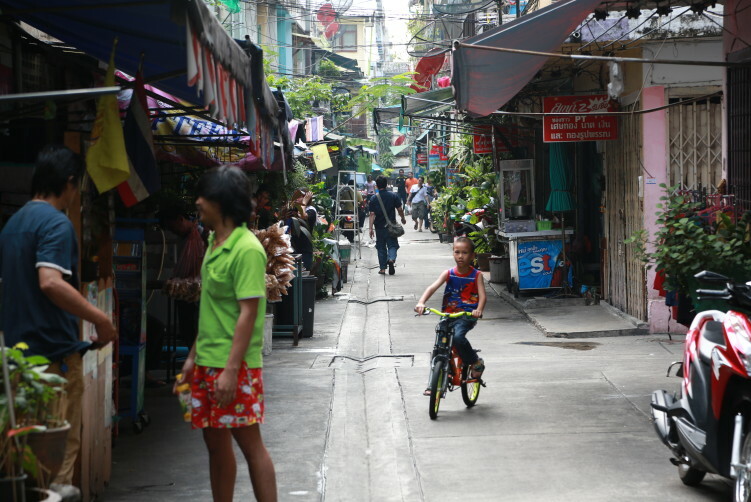 I have walked through the market area and is back in the open, passing a small square used as a playground between the river and some not to well kept houses, hidden between some high rise trees that give a bit of shadow to the local kids playing a game or two. Nothing fancy, but available space. A couple of them wave at me when I stop to watch, smiles, one of them shouting a few words in English, maybe to show off for his friends that he masters the language, that no stranger is a stranger to him. The other guys are laughing. Happy kids, enjoying life. I wave back and shoot a couple of photos, before moving on. I’m heading for the river, after another 15 minutes of walking the narrow streets. There’s a nice walkway along the riverside. 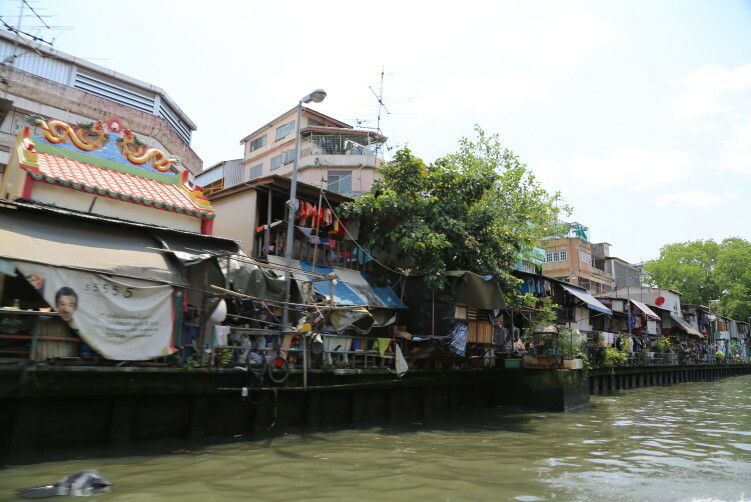 I follow it and have to take a quick visit into to the more busy parts of Bangkok as I have to cross the river to get to the boat taxi pier on the other side. A boat trip along the Khlong Saen Saeb river is an excellent way to see other parts of Bangkok that still has escaped the modernization of the city. 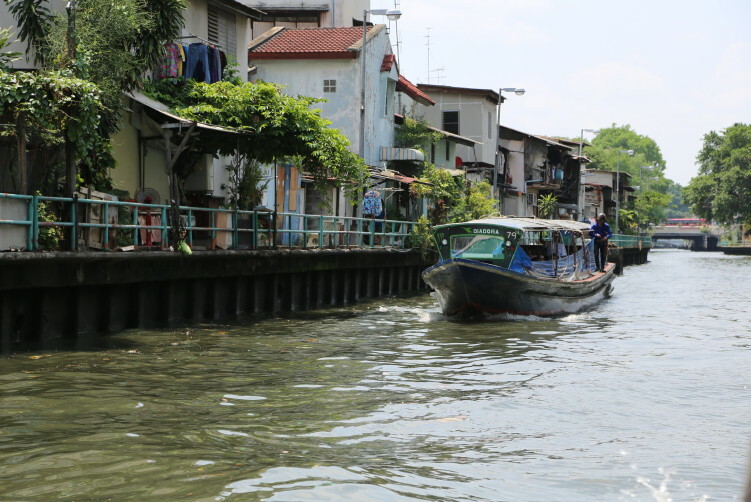 The Taxi boats are also efficient transport to move around in the city. But old Bangkok is quickly disappearing and broader streets are occupying new areas, it all gets more and more packed. It also gets more vibrant, but it has it’s price. I have no idea what Bangkok will look like in another 30 years, but I know I appreciate these peaceful lungs of Bangkok that still can be visited. And if you’re hungry, Phetchaburi Soi 10 is a good street with plenty of options. 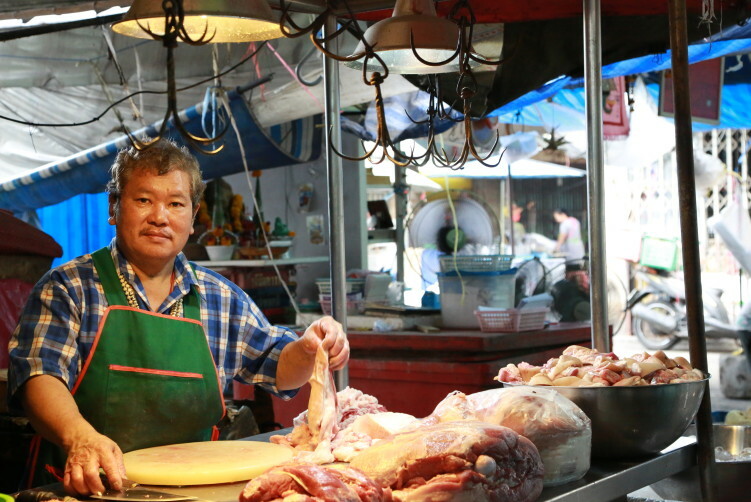 Soi 5 and Soi 7 (Halal food) are two other options, but then you have to cross Phetchaburi road. click here Area: Between the canal and Phetchaburi Road. Entrance from Soi 12/1. 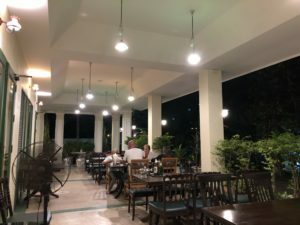 buy now How to get there: Take the BTS to Ratchatewi, walk down exit 3 and follow Paya Thai until you get to Phetchaburi Road, then take to the left and walk on for a couple of minutes until you get to Soi 12. There you take to the left and walk down the soi for a couple of minutes until you reach Soi 12/1 on your right side. walk through the small tunnel and just follow your instincts from there on. A walk into Petchaburi Soi 12/1 (soi 12/2 in google maps) shows you the old style Bangkok 30-40 years ago. Peaceful and energizing.